Crown Trade transformed Coast and Country Housing’s complex – consisting of 38 one-bedroom flats – using a calming and muted colour pallet of its flame-retardant Timonox paints. The new stairwell of Raithwaite House following a makeover with Crown Trade’s Timonox Flame Retardant paint. Colour specialist Jemma Saunders from Crown Paints worked with the tenants to find the ideal solution, ensuring they were involved at every stage of the renovation project. Residents opted for a colour scheme featuring fawn and yellow feature walls. Crown Trade’s Timonox is applied to walls and ceilings of corridors, stairwells and other communal areas that form part of a circulation area or fire escape route – the flame-retardant paint helps to provide additional time for a building to be safely evacuated in the event of a fire. Timonox limits the oxygen around the flames through the release of non-combustible gases, and uses a formulation that provides a barrier to the flammable paint layers underneath. 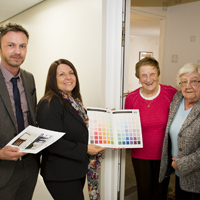 Crown Paints Colour Specification Manager Dan Anderson, Coast and Country’s Diane Kemp and residents Doreen Ash and Agnes Mitchell. Safety was a key aspect of the refurbishment, which included new fire alarms, smoke alarms and wiring. Crown Paint’s experts not only considered the safety aspects, but also ensured the colours complied with the Equality Act, creating a visual contrast to highlight separate zones and objects within a space to assist the visually impaired. In addition to Crown Trade Timonox flame retardant coatings, Crown Trade Full Gloss and undercoat were also used on the project.